1 Iain McCormick 5:55.57	 M Kokanee Possible New Saskatchewan Record. 2 Reid B 8:20.96	 M Alexander Keith's Always ready to party, especially after running a 40 second PB. 3 Jared W 8:38.45	 M Kronenbourg 1664 Nearly threw up on the last lap but was able to recover with a fantastic burp and kicked sub 30 on the last 200m. Speed suit. PB. 4 Graham W 8:39.38	 M Molson Canadian Ran in a stunning green speed suit. Started his kick too early and was passed in the final 100m. 5 Austin G 9:56.32	 M Budweiser Rookie drove in from out of town. 6 Erik W 11:10.3	 M Molson Canadian Penalty lap. Is now permanently hung over. 7 Ryan K 12:49.37	 M Heineken Pulled both his hamstrings while drinking his first beer. 8 Kaden N 13:03.27	 M Budweiser Rookie drove in from out of town. Says it was cold. Award for best puke. Penalty lap. 9 Coleman P 13:57.13	 M PBR Flew in from Vancouver just for this. Penalty lap. 10 Jordan J 18:00	 M Alexander Keith's DFL. 11 Davis G DNF	 M Okanogan Cider Time: 8:00.16. Disqualified for not drinking beer. 12 Sophia Z DNF	 F Grolsch Time: 13:19.51. Disqualified for unsportsman like conduct, verbally abusing officials, not actually drinking the full beers. 13 Leadan C DNF	 F Maui Brewing Company Pineapple Beer Time: 14:17.57. Disqualified for not drinking beer, not actually drinking, poring out drink instead of drinking it. 14 Lynette M DNF	 F Alexander Keith's DNF. 15 Matthew D DNF	 M Coors DNF. 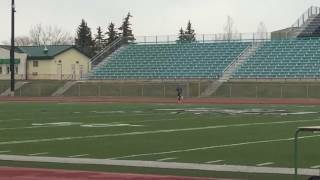 On a cold spring evening Saskatchewan's best beer milers gathered at Saskatoon's official beer mile track to throw down and throw up at the Second Annual Spring Classic Beer Mile. Following the conclusion of the mile a 4x400m beer relay was also held. Also Iain "I-Ballz" McCormick was there.